We have been hearing a lot about resistance in these early days of the Trump administration. 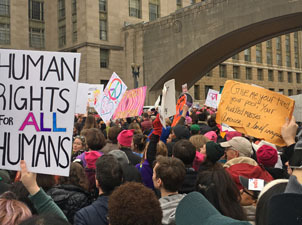 In fact, on the first full day of his presidency millions of women, men, and children organized and joined together to stand for justice in the streets. We have also been hearing a lot of questions about what comes next. How does this organic expression of outrage and concern for equality and the common good become an effective movement? How do we take advantage of this moment in history to effect change, stop the carnage of unjust social policies—to repurpose a phrase from President Trump’s inaugural address—and promote justice for all, especially people who are poor and marginalized? Whatever comes next, it is crucial that we develop an ethic of resistance that is grounded in human dignity and right relationship. Otherwise, we face the danger of recreating and repeating negative cycles of violent and dehumanizing language and actions. Relationship is key to resistance—we are first and foremost human beings after all, created to be in relationship with one another. It is our compassion for other human beings and our earth community that compels us to resist. An ethic of resistance requires a firm commitment to hold fast to the truth of human dignity of all people and the integrity of creation, to lament the unjust social structures and social norms which foster and perpetuate dehumanizing and earth-destroying policies, and to seek to heal the relationships distorted by social sin. In fact, we would all do well to read up on the history of resistance to social sin. Resistance is not futile, but neither is it easy. The Christian tradition of resistance begins with Jesus, and think of where his path of resistance led. Jesus resisted dehumanizing social norms, created a wide web of relationship, and engaged in liberating action for the oppressed. In the centuries since, Christians have followed in his footsteps and resisted social sin and injustice. Human communities have even managed to resist extreme expressions of social sin, such as slavery and the Nazi holocaust. Please God, do not let our current situation reach such levels, but we must do all we can to resist even the most remote possibility of such extreme social sin emerging from the fog of fear, distrust, and isolationism. The end goal of resistance should be right relationship. To reach that goal we must carefully peel away the layers of disconnection which have been created through social sin. The first layer of resistance is what has been happening in the collective awakening all around us. We need to remove our own blinders not only to the existence of dehumanizing and earth-destroying policies and practices around us, but also to the ways that we ourselves are enmeshed within these unjust structures. Only then can we work with integrity to socialize this awareness by raising the consciousness of others. The next layer of resistance is an emotional one—lament. Our critical consciousness must lead us to lament the reality of the benefits we receive at the cost of the heavy burdens born by others. Because our actions of resistance take place within the dominant culture, within what Cynthia Moe-Lobeda calls a “paradox of privilege,” we must lament before we can seek truth and justice in solidarity. Fr. Bryan Massingale believes that such lamentation “has the power to challenge the entrenched cultural beliefs that legitimate privilege.” It is a crucial step toward expanding the web of relationship to include all persons, especially marginalized people. The encouraging movement towards intersectionality within the emerging resistance movement is a positive step in this direction. The final layer of resistance is to shift from inaction to action from within your sphere of influence to heal the relationships distorted by social sin. Resistance actions are not and cannot be limited to grand scale marches and demonstrations. Our daily lives as ordinary citizens, neighbors, and consumers are filled with individual choices that hold potential for collective power. Indeed, the history of social movements illustrates the collective power of resistance to social evil and its ability to effect lasting social change. Massingale, “The Systemic Erasure of the Black/Dark Skinned Body in Catholic Ethics,” in Catholic Theological Ethics, Past, Present, and Future: the Trento Conference, ed. James F. Keenan (Maryknoll, NY: Orbis Books, 2011), 121. This entry was posted in Front Page, Sister Spirit on February 6, 2017 by networklobby.